How do you start your mornings? 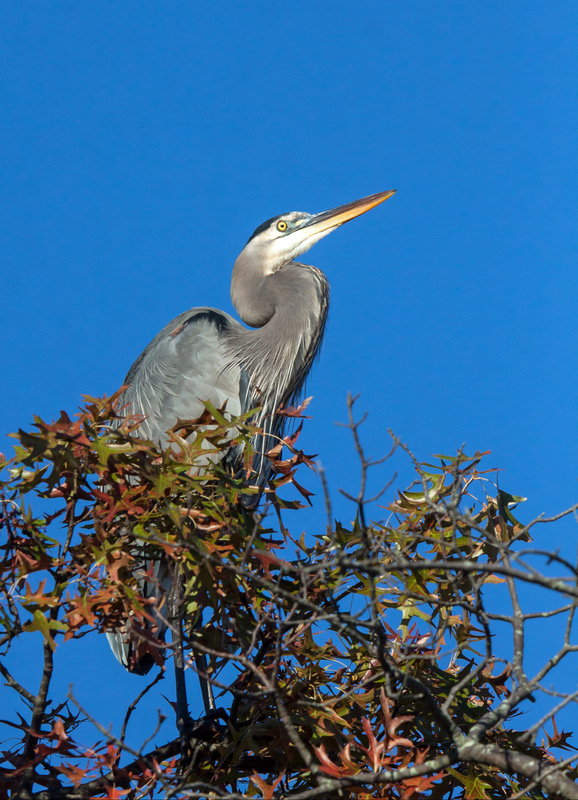 This Great Blue Heron (Ardea herodias) faced into the morning sun for quite a while last Friday as it stood amidst the foliage atop a tree at Occoquan Bay National Wildlife Refuge. 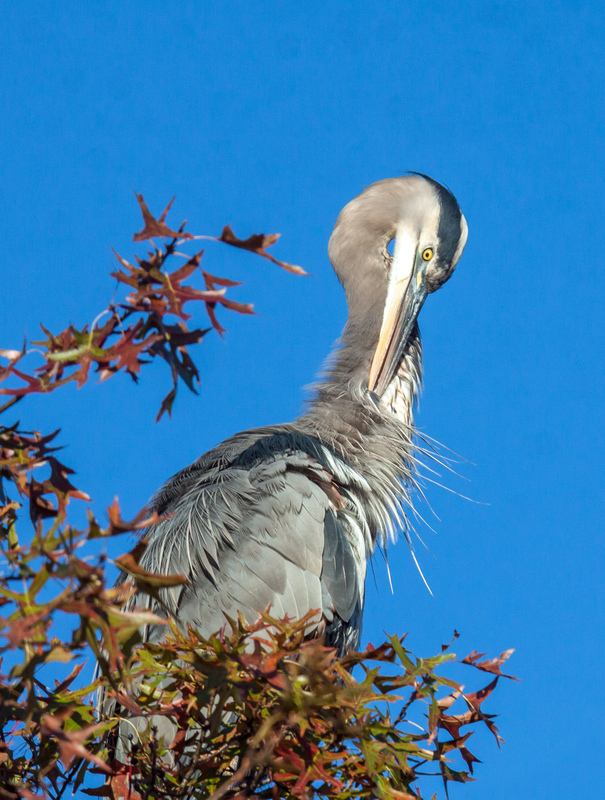 The heron looked around a bit before deciding it was finally time to start its morning grooming routine. The light was especially beautiful that morning and the heron was either unaware of my presence or simply did not view me as a threat. 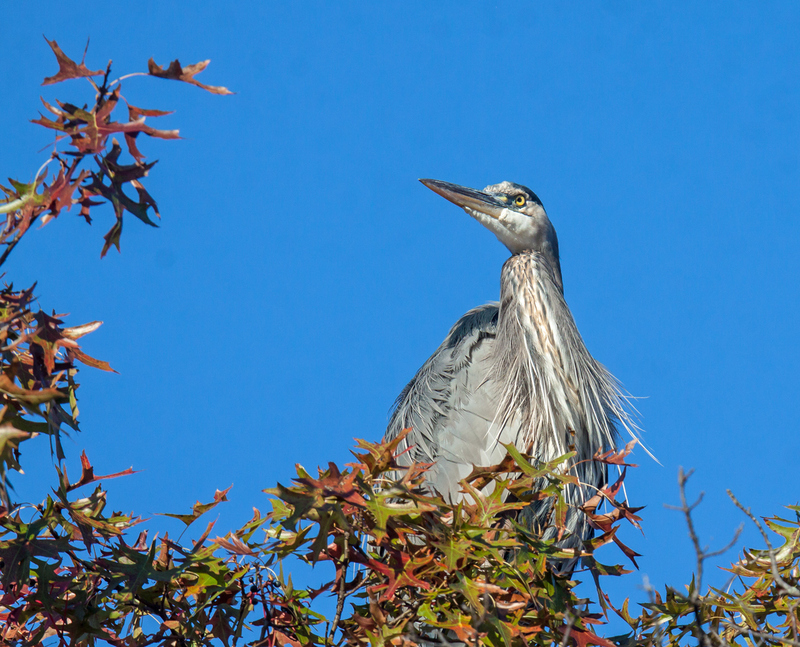 After I took some shots, I continued on my way and the heron remained in the tree and continued its morning preparations. 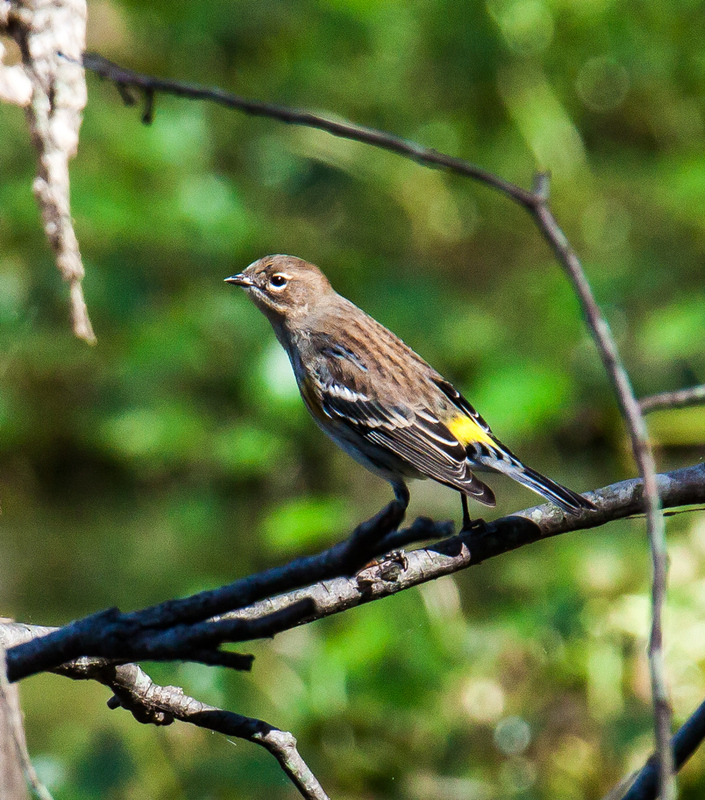 A flock of noisy, black-colored birds was active this past weekend at Occoquan Bay National Wildlife Refuge. 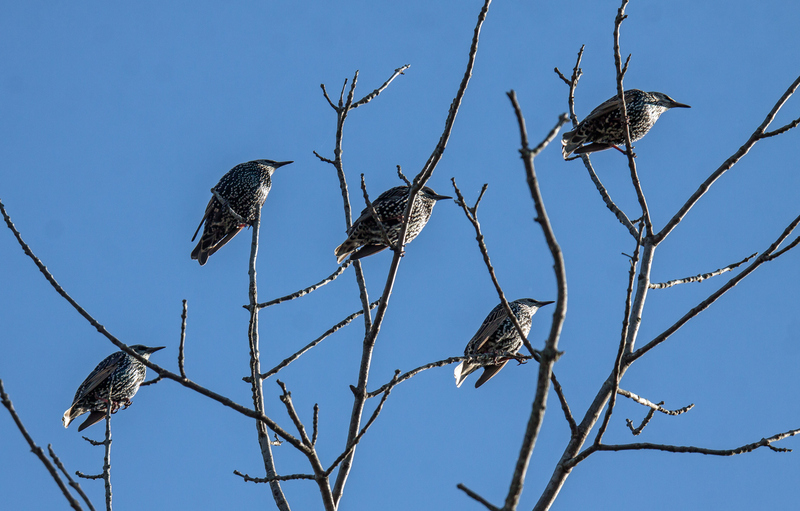 I initially thought they were blackbirds or grackles, but a closer look showed them to be European Starlings (Sturnus vulgaris), a species introduced into the US from Europe by Shakespeare enthusiasts late in the nineteenth century. To be or not to be? 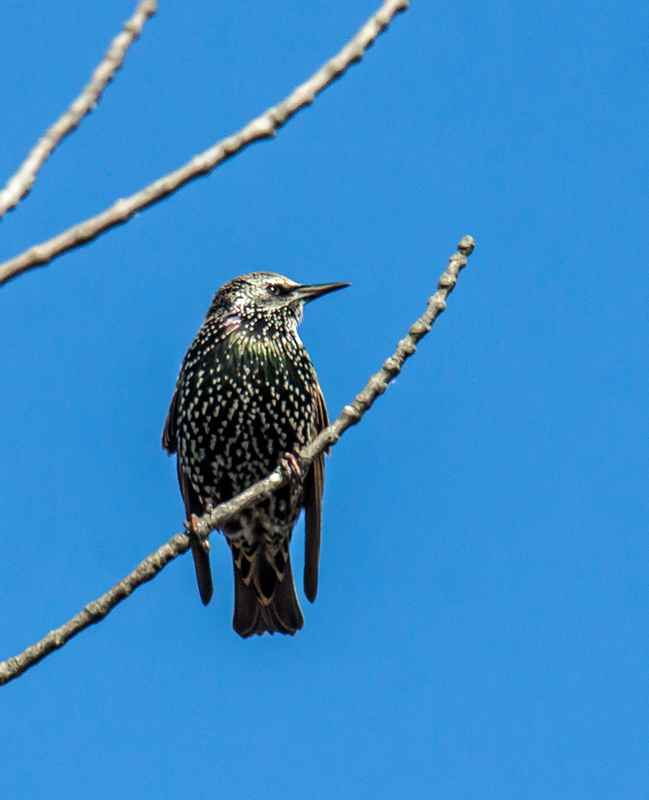 Whether you like them or not, it looks like European Starlings are here to stay. As for me, I find the dotted pattern on these birds to be quite attractive. 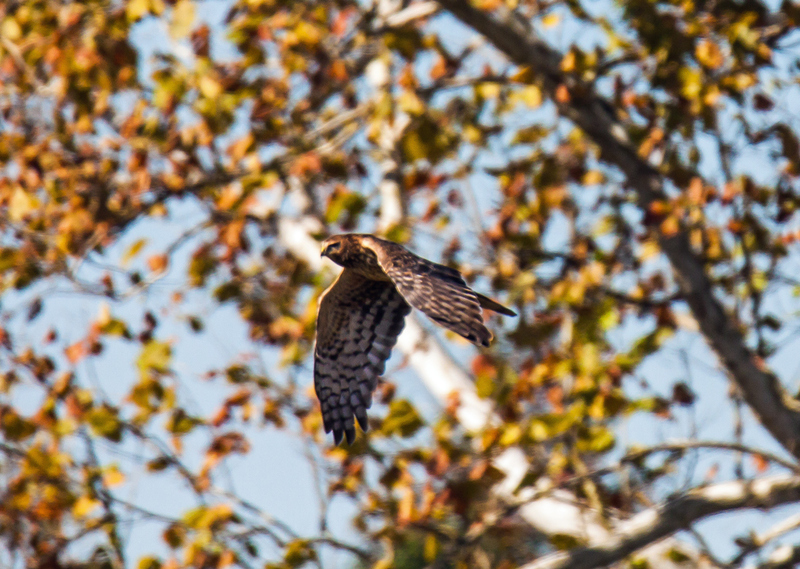 This past Friday I was thrilled to spot a Northern Harrier (Circus hudsonius) at Occoquan Bay National Wildlife Refuge. I had never seen one in action before and it was cool to watch it patrol low over a field at the refuge. Harriers, unlike other hawks, rely on their sense of hearing to help capture prey, which is why they stay so close to the ground. 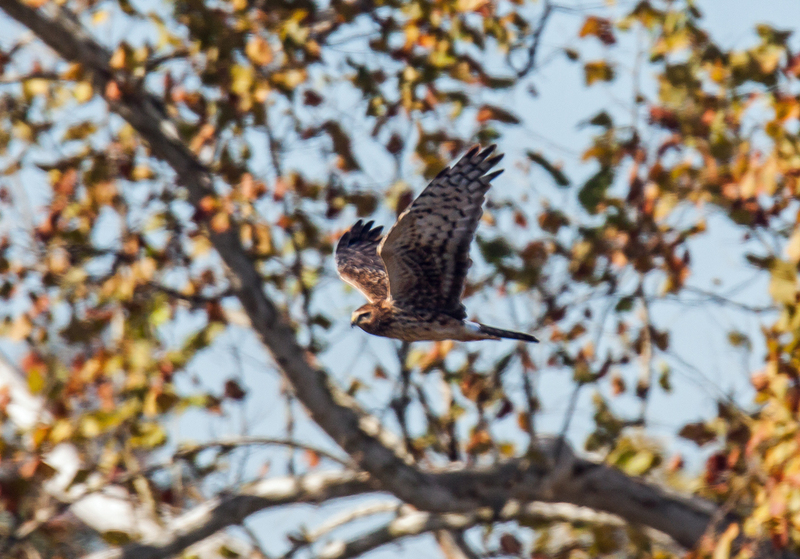 If you want to learn more about Northern Harriers, check out the Cornell Lab of Ornithology website, one of my favorite sources of information about birds. It was exciting to see this bird, but it sure was a challenge getting any decent shots. The harrier was a good distance away and seemed to vary its altitude in an unpredictable way. When it zoomed low, my camera wanted to focus on the ground vegetation and when it flew a bit higher, the camera sought to focus on the more distant trees, rather than on the bird that filled only a small part of the frame. The two images below were the best that I took before the harrier disappeared from sight and show some of the features of this awesome raptor pretty well, including the face that guides sometimes describe as owl-like. It is always exciting to photograph a new species, but an inner desire to get more and better images of a new subject is sufficient motivation for me to go out again and again with my camera. 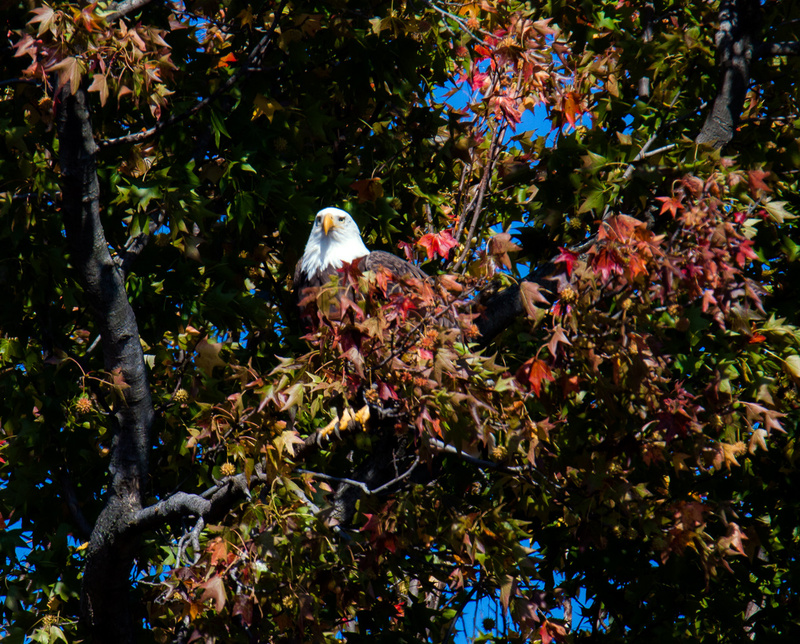 As I zoomed in on a bright white splotch of color in a distant tree at Occoquan Bay National Wildlife Refuge on Friday, I realized it was a Bald Eagle (Haliaeetus leucocephalus). almost hidden in the autumn foliage. 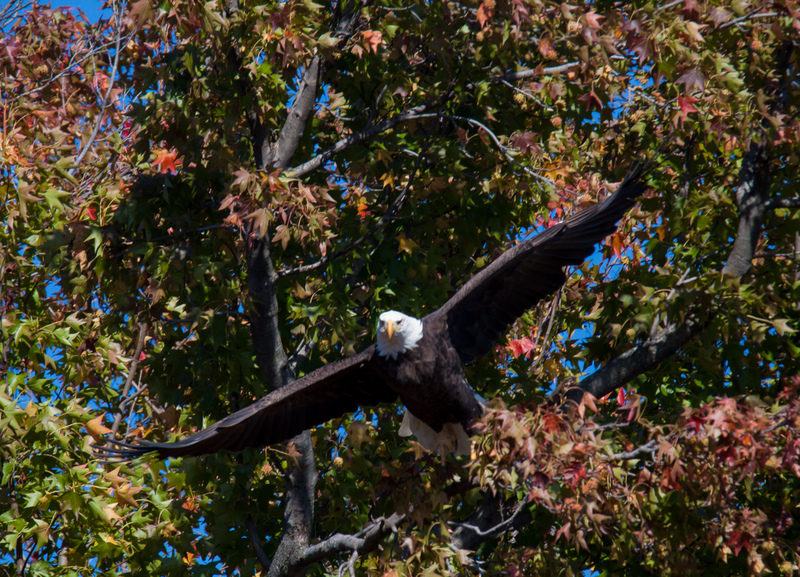 The eagle reacted quickly to my presence and took to the air, but I was able to capture a few images of this majestic bird. 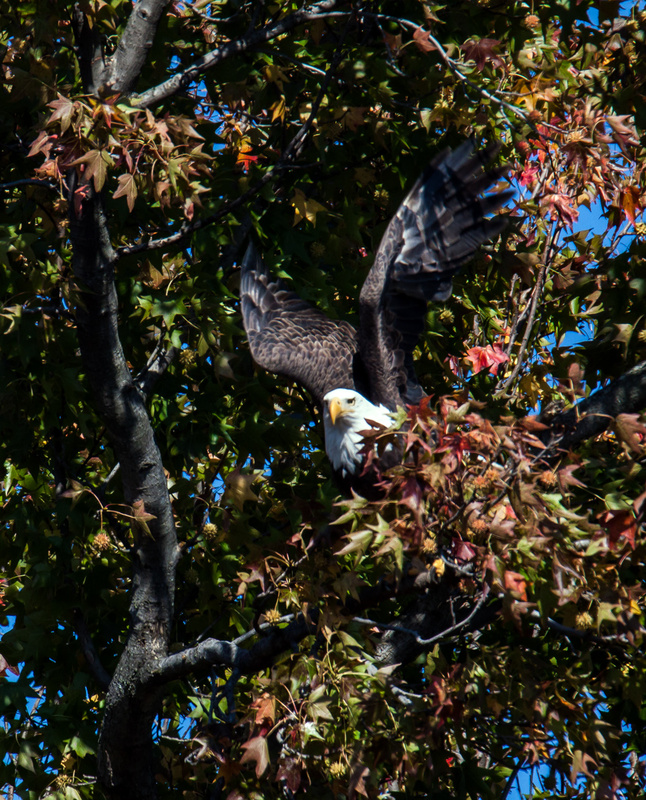 Photographing a bald eagle is always a challenge. One of the biggest issues is the contrast between its bright white head and dark body, making it tough to get a good exposure. In this case, if I had had a little more time to check my exposure, I might have been able to avoid blowing out the details in the eagle’s head. Time, though is something that I usually don’t have. The eagle’s vision and reaction time are so far superior to mine that I have to react immediately when I spot an eagle, usually with the settings that already dialed into the camera. On multiple occasions I have missed opportunities as I scrambled to make adjustments to my camera. Finally, it is often hard to predict an eagle’s actions and the direction in which it will choose to fly. This was a somewhat unusual situation in that the eagle initially flew right at me. You have to have really steady hands and a lot of luck to maintain focus when a bird is coming at you that fast. I didn’t quite nail the focus on the eagle’s eyes in the final shot, but am happy at the way that I was able to capture its fully extended wings. This situation reinforces in me the continuing applicability of the Boy Scout motto that was drilled into me as a youth—”Be Prepared.” You never know when you might stumble upon a Bald Eagle. 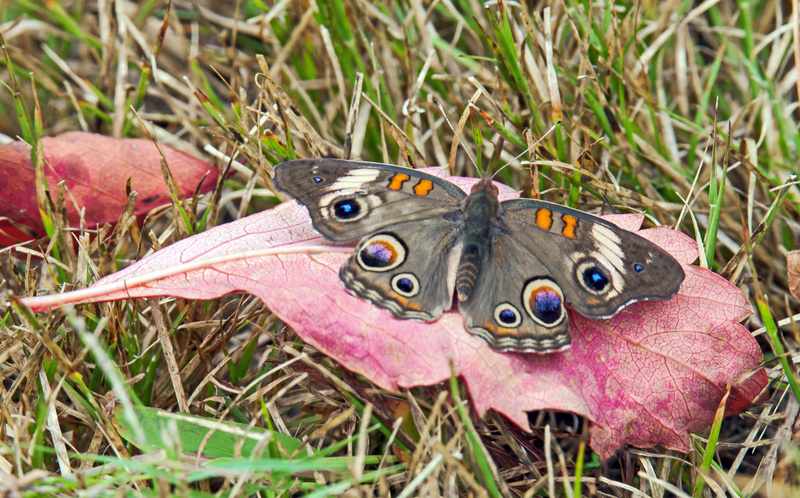 We are deep into autumn now, but some butterflies are still hanging in there, like this beautiful Common Buckeye (Junonia coenia) that I spotted during a recent trip to Occoquan Bay National Wildlife Refuge. I was actually a little shocked to see quite a few of these butterflies flying along the paths of the wildlife refuge and in some of the open areas. The challenge for me was getting one to pose in a way that would convey a sense of autumn. I was therefore thrilled when this one perched on a fallen leaf and and kept its wings wide open long enough for me to capture this shot. 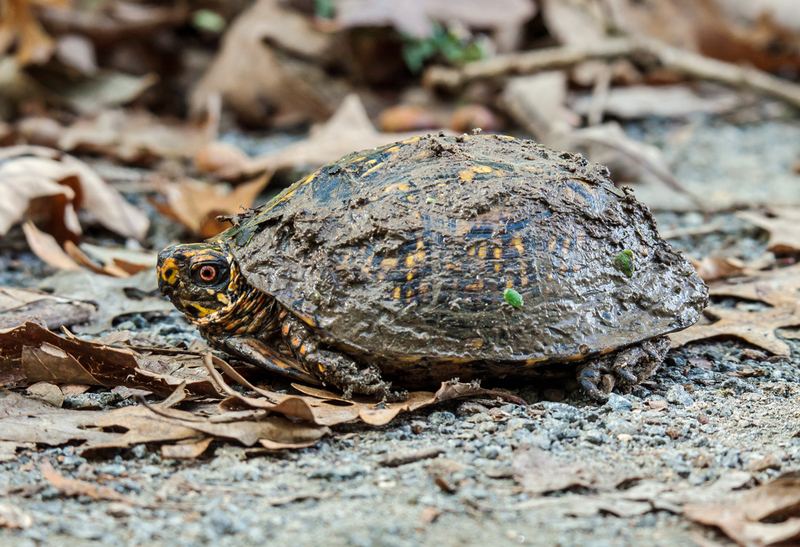 I was moving slowly this past Monday as I sought to get photos of birds at Huntley Meadows Park, but not quite as slowly as this Eastern Box Turtle (Terrapene carolina carolina) that looked like it had just crawled out of the mud. This species of turtle has a beautiful pattern on its shell, but it is mostly obscured by the mud. I think that I might have startled the turtle, because it pulled its head and body inside of the shell for a little while, making it almost perfectly camouflaged, despite the fact that it was sitting right on a path. I am not sure why, but I have seen more warblers this autumn that I have ever seen before. In past years they always remained elusive, hidden behind the foliage, heard but not seen. This year I have seen them, especially Yellow-rumped Warblers (Setophaga coronata) at several locations and on several occasions. 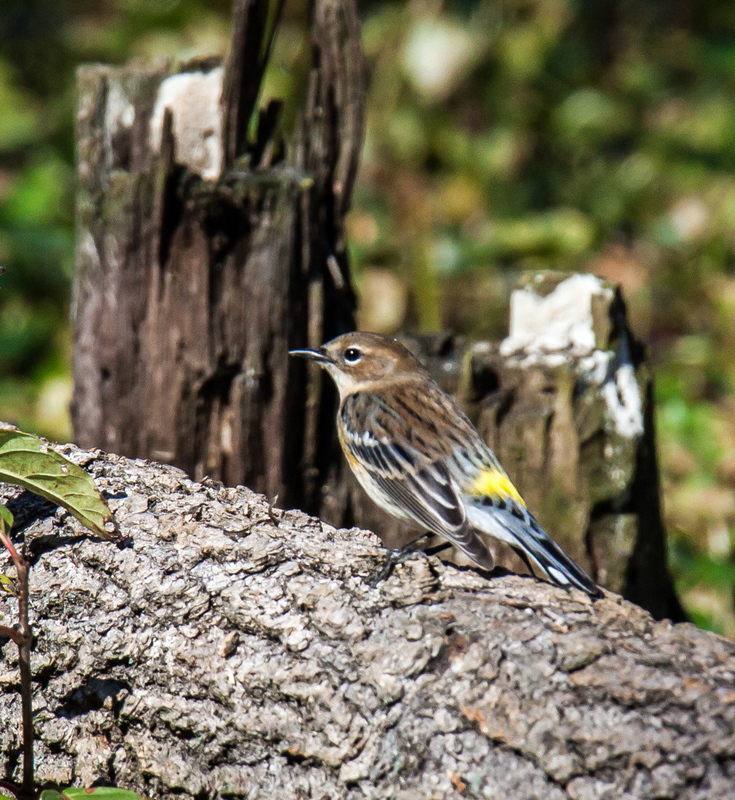 Here are several of my favorite warbler shots from this past weekend at Huntley Meadows Park. The first image, my favorite, is one of those lucky shots that occur when a bird takes off just as I press the camera’s shutter button. 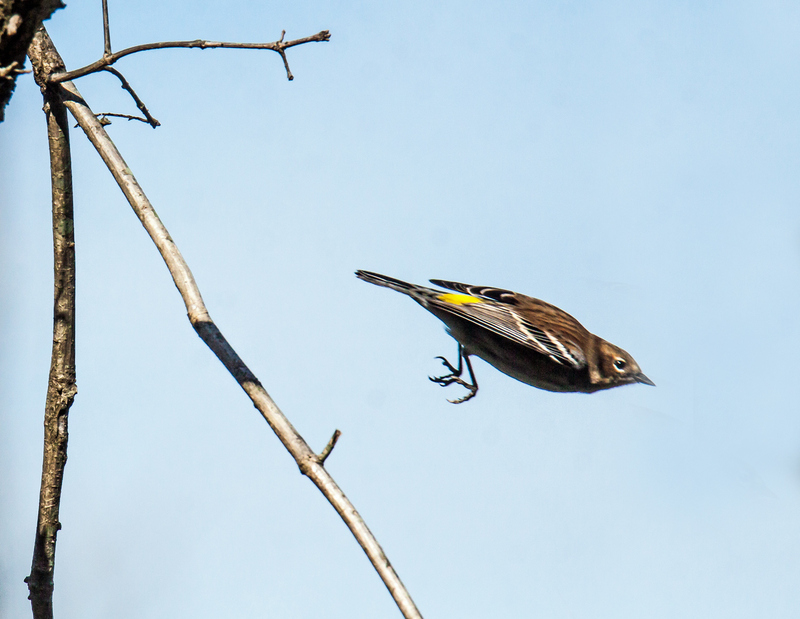 Normally that results in a bird that is out of focus or partially out of the frame, but this bird took off slowly and in a direction parallel to where I was focusing. Sometimes it is better to be lucky than to be good.